If you wish you can slice the profiteroles in half and add some cream, the add the top and drizzle with cream. Preheat the oven to 180˚C/350˚F/Gas Mark 4 and line 2 baking sheets with greaseproof paper. Remove from heat immediately and add the flour. Stir rapidly with a wooden spoon. Return to heat and beat continuously until the mixture comes clean away from the sides of the saucepan. Transfer to a large mixing bowl and add eggs to the hot mixture one at a time beating thoroughly after each addition and until smooth and glossy. Fill a piping bag with a large nozzle and pipe walnut size choux onto the baking tray . Bake for 35-40 minutes until hollow when tapped underneath. Remove from the oven and allow them to cool on a wire rack. Meanwhile, prepare the chocolate sauce. Bring the cream to the boil then remove from the heat. Place the chocolate pieces into a bowl then pour half the boiling cream over the chocolate, stir to combine, then add the remaining cream (this will avoid the mixture splitting). Add the butter, and stir until smooth, then keep warm until required covered with a layer of cling film. In a large bowl, whip the cream until at the soft peak stage. Add the pistachios and green coloring and spoon into a piping bag, set with a nozzle. 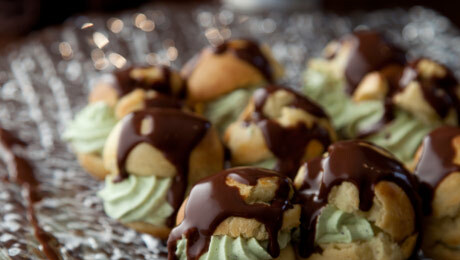 When the choux are cooled, fill with pistachio cream and serve with chocolate sauce.